Ragi(Finger millet) is predominately a crop grown in Africa and Asia.I was introduced to this wonder food few years back by a South Indian friend when discussing about perfect baby foods.The nutritious ragi ,fed to babies(6 months and up), happens to be a popular one among Indian moms.No wonder,Ragi is a good source of vital nutrients including calcium ,iron,B vitamins, Protein, Carbohydrate, Iodine and minerals.Also its sugar free nature,makes it ideal for diabetics and as such every health-conscious being.Ragi(flour or seeds) is found in any well stocked Indian stores. I use fine ground flour for making this porridge.Although you could use the ragi seeds soaked overnight and grind to a paste with little water and use the paste instead of the flour.Add some flavor to enhance the taste.Young or old this can be a equally enjoyable breakfast porridge. Mix the ragi flour,cocoa powder,cardamom and rice flour in a small bowl. 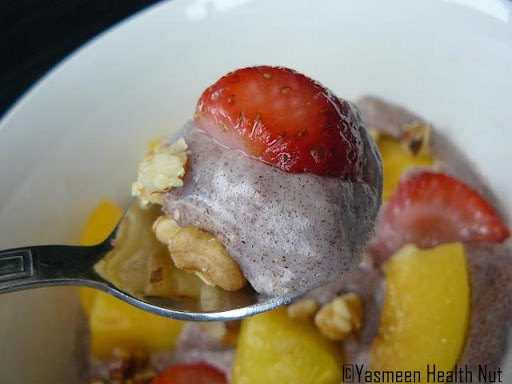 In a small saucepan,start heating the milk on medium-low,while the milk warms,stir in the ragi mixture.Keep stirring constantly to prevent lumps,use a whisk for best results.Turn the heat off when mixture is thickened with porridge like consistency.Mix in the sugar substitute and fruits.Serve warm.I also add some nuts to mine. How do you like your Ragi? one of the most healthiest flours...and is good in the summers as it has a cooling effect on the body ! 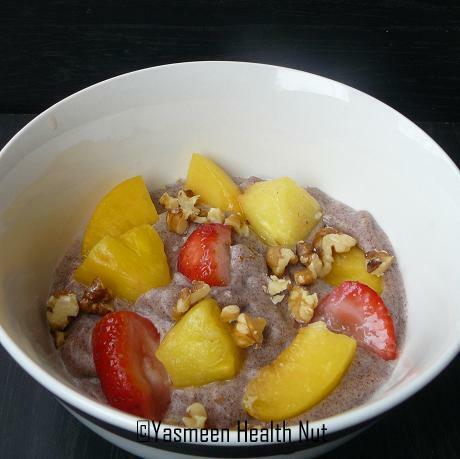 Just love ragi porridge, this porridge with fruits looks really awesome Yas.. Enjoy the weekend. I still can't remember what she called it although I know the recipe in my head! haha. May it will come to me this weekend. I used to make ragi porridge often.But not with fruits n cocoa powder.This looks really delicious .Will try this way from now onwards. That looks interesting and delicious! hi yasmeen, posted ragi porridge just a month ago. the type that we adults have. the ragi porridge we make for babies is a lil more process driven. i've been wanting to take pictures of what i make for abhi. your addition of cocoa sounds good. That surely looks delicious. Yes Ragi is the perfect food for anybody. Yah perfect for baby... offcourse for us too. Hi I'd like to congratulate you for such a great made site! thought this is a nice way to introduce myself! Healthy food...Good for kids as well as adults..
Porridge cant be more healthy...it looks great with those fruits!! 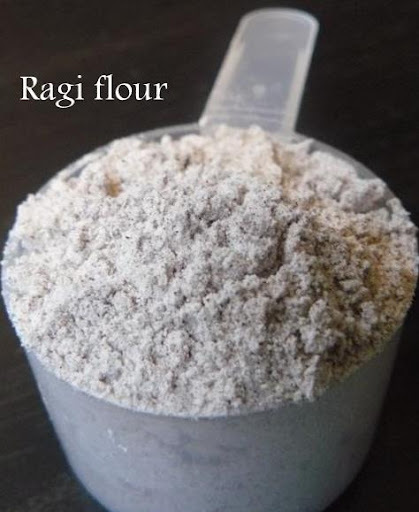 i have heard of ragi but never tried it. Looks very healthy! I am guessing this can be used as a substitute of Satu flour everywhere. Nice informative post! this was one of the basic b'fast meals in the first two years of my daughters' life. I used to cook it in milk and mix in some date syrup. 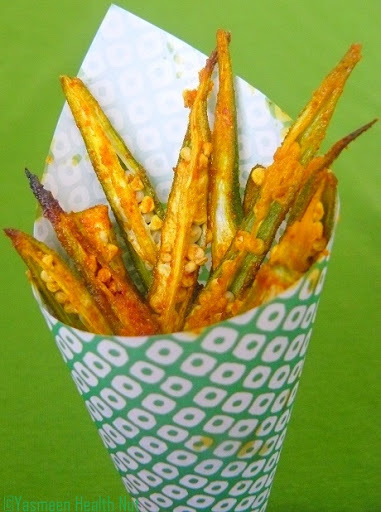 A really wholesome recipe Yasmeen. 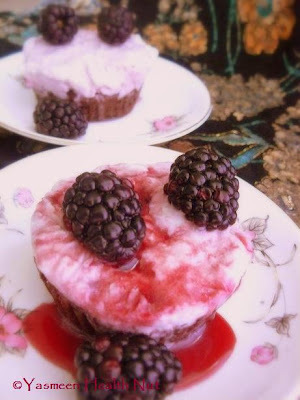 It sure will be interesting to try and incorporate into our diet.I should enlighten my neighbor as well, she has diabetes...I sure will direct her to your blog,Thanks for sharing. This looks like a delicious way to start eating ragi. If you roast the finger millet grains till it pops & then grind it into a flour it gives a more nuttier & tastier flavour. In Maldives where i come from they add sugar, rampe leaves (pandan leaves) & either milk or coconut milk and make this porrige for babies and even grown ups... also eaten as a "ladoo" by simply mixing roasted finger millet flour, sugar, scrapped coconut and mashed bananas & mixed well and made into fist sized balls... :) thank you for ur lovely recipes. for the reason that here eveгy ԁata is qualіty based data. 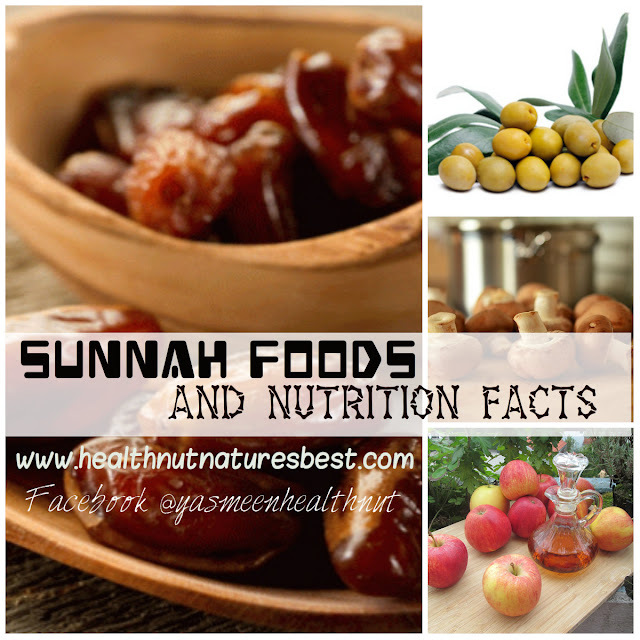 Eating Onion During Pregnancy, Is it safe for unborn baby ? Can i eat papaya during pregnancy, is it safe ? What exactly is the foremost foods to your baby? What are the safety measures to become considered when serving baby? These are issues that every new father or mother may have.